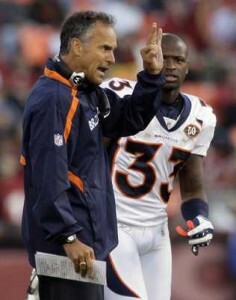 Fewer than 24 hours after splitting from the Denver Broncos, Mike Nolan was hired by the Miami Dolphins to be their new defensive coordinator. Nolan replaces Paul Pasqualoni, who was fired after the Dolphins’ 7-9 season. They allowed 390 points, the third-highest total in the AFC. The Broncos started the season 6-0 and were the talk of the league. Nolan received much of the credit as he turned around a defense that ranked near the bottom of the league in every major category in 2008. Nolan’s scheme shaved 7.8 points a game off a defense that surrendered 28 points a game the previous season. Then the team went into a free fall, losing eight of its next 10 games to miss the postseason for a fourth straight year. Nolan was the 49ers’ head coach in 2005-08. Nolan, whose father was also an NFL head coach, was defensive coiordinator for the NY Jets, Washington Redskins, Baltimore Colts, and New York Giants before his gig in San Francisco. Nolan inherits a defense that has some talent, but its either- young and error prone, erratic, or getting up in years. The Dolphins are in need of help at Defensive Tackle, Linebacker, and Safety. How well Miami does in the 2010 will be the deciding factor as to whether the Dolphins defense improves or declines next season. I think it slides or maintains the status quo myself.